If you often dye your hair, you must be aware of the fact that it is bound to be damaged, dry, the colour might fade and increased hair loss that results in loosing density. The truth is that after dyeing, your hair is beautiful and shiny only after about a week from the treatment. Then comes the less pleasant time for your wisps. They become rough, unpleasant to the touch, lose their luster, begin to frizz, the ends split and become dry. Strands begin to break and their colour fades. In order to prevent such horrible effects, an appropriate care and nourishment is a must. Proper shampoo and conditioner – yes, of course, but it is not enough to ensure decent care. the best solution will be regular use of a suitable hair oil, especially designed for colour-treated hair. Fortunately, Kerastase brand has such oil in its offer. Elixir Ultime Oleo Complexe The Imperial is a hair oil that comes in a pink, glass bottle, with the capacity of 100 ml. It is equipped with a pump that that facilitates application. The product has a nice, intense scent, slightly sweet, that maintains on hair for a long time. The product owes its nurturing and adding shine properties to four natural oils. The dominating ones are camellia and argan oil. Additionally, Elixir Ultime Oleo Complexe The Imperial also contains corn oil and a unique pracaxi oil. What are all the oils responsible for? Camellia oil is famous for its high concentration of omega-9 oleic acid. It is a perfect antioxidant preventing premature hair ageing. Camellia oil is valued for its moisturising and taming properties. What is more, it soothes scalp irritations, helps reduce dandruff, prevents hair loss. Due to the moisturising and protecting effects and a gentle action, it is often compared to olive oil. It protects hair from mechanical damage and adverse weather conditions. Camellia oil has another valuable property: it prevents toxins from penetrating deeply into the hair. Argan oil present in Elixir Ultime Oleo Complexe The Imperial is especially designed for colour-treated hair, susceptible to damage. It protects hair from both the ammonia contained in many air dyes and any other mechanical damages. Therefore, it intensifies the effects of camellia oil. Corn oil which also appears in high amount in Elixir Ultime Oleo Complexe, is the source of omega-6 fatty acid. It slows down the ageing processes of skin and hair, due to the high content of vitamin E.
Pracaxi is an oil that soothes any irritations, has antibacterial properties, improves processes taking place in the cells. Similarly to camellia oil, it has moisturising and soothing effects on both hair and scalp. 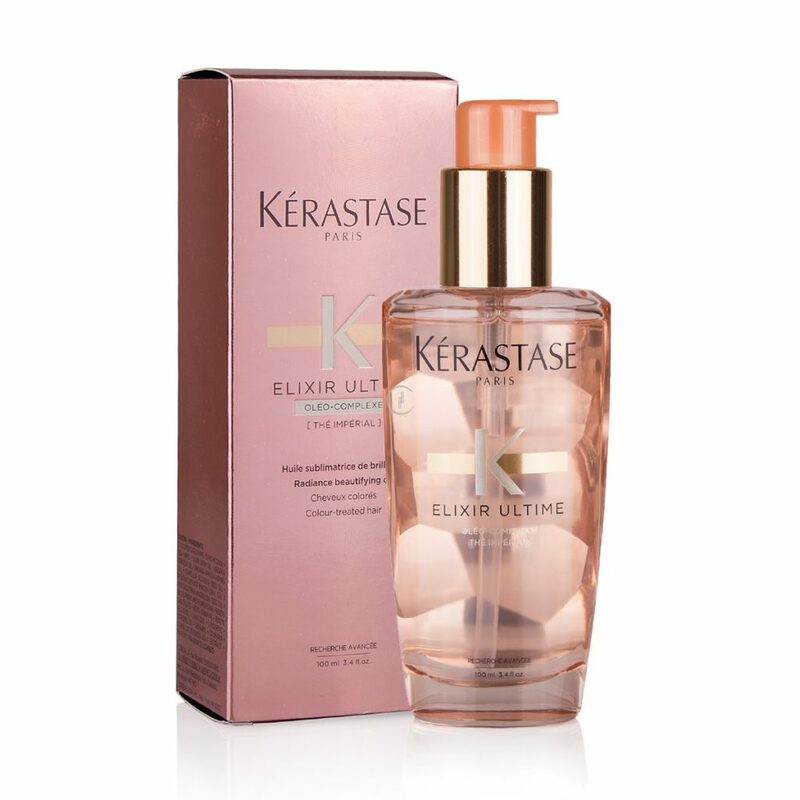 Elixir Ultime Oleo Complexe from Kerastase can be applied in many ways: on dry as well as damp hair, before washing or right after showering, during daily styling and as a hair ends serum – whenever you feel that your wisps are losing resilience and brilliance.